Check out some of our San Francisco Mint coins recovered from the S.S. Central America here. The Liberty Head Quarter Eagle has the distinction of being the longest-running coin of this type, in the history of American numismatics, without a major change in its design. And unlike half eagles and eagles, the motto IN GOD WE TRUST was never added to the quarter eagle. Imagine you’re the U.S. Mint in 1849. 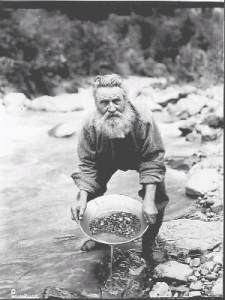 The California Gold Rush is in full swing. Enormous quantities of gold are flooding California and your only way to coin it is to send it on a perilous journey to Philadelphia and then transport the coins back. What do you do? That’s where the San Francisco Mint comes in. Founded in 1854, the mint turned miner’s gold into coins, producing $4,084,207 in gold pieces in its first year alone. 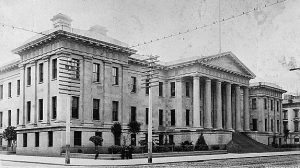 It soon needed more space than its initial, small brick building, and in 1874 the mint was moved to a grand, Greek Revival Style building. The Granite Lady, as the building was dubbed, sat on a concrete and granite foundation designed to prevent tunneling into the mint and to withstand earthquakes. An intriguing legend has it that the cornerstone was laid during a Masonic ceremony and filled with gold coins struck at the mint. The San Francisco Mint also played a pivotal role in the greatest maritime disaster in American history. 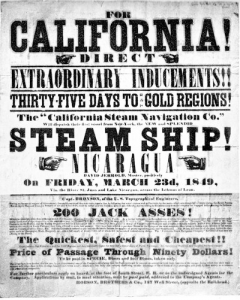 In 1857, more than two tons of gold dust, nuggets, coins and ingots from the California Gold Rush were loaded onto the S.S. Central America, which regularly transported gold from California to the east coast. After being caught in a hurricane off the coast of the Carolinas, the S.S. Central America sank and the human and financial loss was felt around the world. 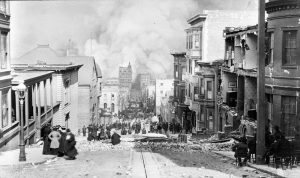 In 1906, the mint suffered a fire (resulting from the massive 1906 earthquake) so intense it melted windows and made granite and sandstone blocks blow up. At the time, the mint help $300 million worth of gold – 33% of our nation’s gold reserves, which was essential to backing up our currency. The superintendent of the mint and his staff were able to protect the gold and the building throughout the disaster, from both fire and looting, and the mint played a role in recovery, being the only supply of water for nearby residents. The Granite Lady lived to fight another day, continuing production up to 1937, when a new mint was opened. The new location struck coins for general circulation, stopped operations for 13 years, and started back up in 1968 by minting proof coins. The mint was officially an assay office from 1962 to 1988, after which it regained its status as a mint. In 2012, the mint started producing circulation-quality America the Beautiful quarters, which were not released for circulation but only made available in 40-coin rolls and 100-coin bags. Today, the San Francisco Mint is the largest producer of collectible coins in the U.S. and the largest proof coin producer in the world. 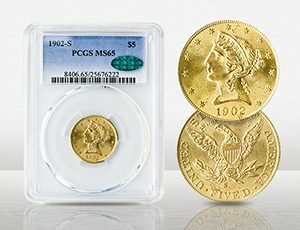 It also has the unique distinction of having the oldest mint mark in the U.S.
Over the years, the San Francisco Mint has produced coins of great numismatic quality. 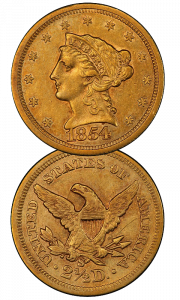 The 1854-S Quarter Eagle, for example, is one of the rarest of all U.S. regular issue coinage, with a mintage in the low hundreds. And a mere 268 of the 1854-S Half Eagle’s were minted, while only a handful survive. We currently have San Francisco Half Eagles and Double Eagles available. If you’re looking for one, or any other particular San Francisco coin, give us a call at 1-888-782-6405. Let a coin from this storied mint be a part of your collection! And now, for a very limited time, we are pleased to offer a selection of San Francisco coins recovered from the S.S. Central America. Each coin is unique and comes with an authentic pinch of gold dust from the California Gold Rush. If you’d like to own a coin from a pivotal time in our nation’s history, give us a call at 1-888-782-6405.